Have you found an online vendor selling Cockspur 5 Star Fine? Cockspur 5 Star is a golden combination of column and pot-stilled rums matured in American white oak barrels before blending. Coral-filtered water is used from a nearby aquifer to dilute the rum to bottle strength. The company Cockspur was founded in 1884 by Danish seaman Valdemar Hanschell. Barbados was chosen as a location beccause at the time it was one of the Caribbean's largest shipping ports. I'm fairly new to the Baja style of rum. I got spoiled with R.L. Seale's 10yr for my first taste, though at least as I move along I can't really seem to find a bad one. Its really nice, and I like that it has some pot-still weight. Has a somewhat thick mouthfeel, with toasty dark sugar and fruity notes, and a spicy finish - all very well behaved and balanced. No added sugar or artificial flavors, and no tricks or misleading labeling. An honest rum; a good one to keep around. Nutty nose with brown sugar. Taste takes a while to come through with delayed tingly spice that lingers. I get walnuts, oak, maybe even a little blueberry undertone. Finish lingers and isn't great, little sour. Not overly complex but surprisingly OK to sip on with a few ice cubes. Lahky a velmi pitny rum, mozno menej komplexny, ale je to cisty mlady rum bez dalsich aditiv, proste rum z Barbadosu. Good taste and smooth on ice. A good rum for the price. 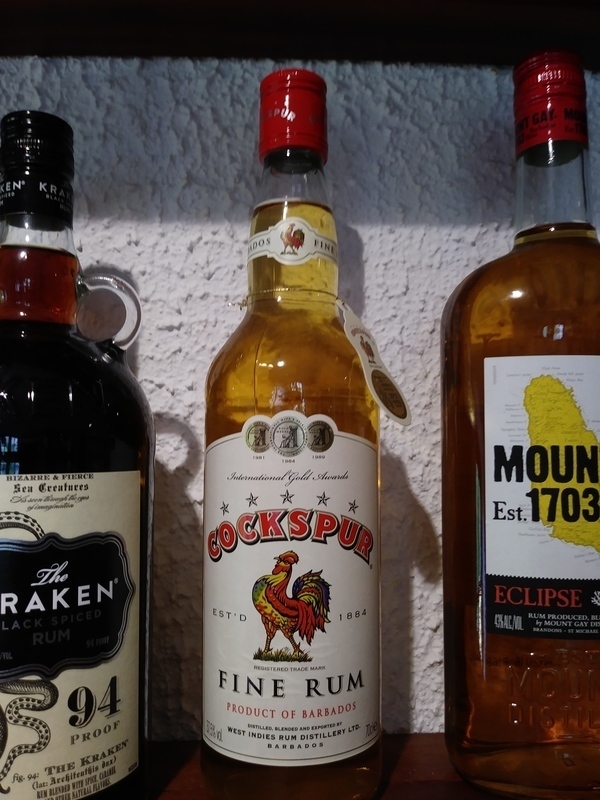 Bought a bottle of Cockspur 5 Star Fine Rum while vacationing in Guadeloupe. Nice old school bottle and label design. Super dry rum with nasty vanilla and strong oak to the nose and palate. Very strong burn at the end being so dry. Nasty even when mixed. A very cheap rum, and I think it justifies the pricepoint. A very dull, weak rum, not much too it at all. Weak caramel flavours come through and while it is not horrible, it is really nothing special. Only to be utilised as a mixer and even then, it only serves purpose to make a drink alcoholic rather than to make a drink that is enjoyable. Rum lacks a bite. To get the taste through when drinking with a mixer it requires double the slug of more potent brands. Not obnoxious but not great either. Nearly no nose perceptible, weak taste in addition. Maybe good for mixing, because there is no annoying taste and the rum is soft. It has been about 30 years since I tried this dry rum from Barbados, probably because I have always preferred sweetened rums up until now. I had also refused to buy any rum with a name like Mount Gay until recently. This one has little or no added sugar. Heavily sweetened rums are not only bad for one's health, but they don't hold their flavor for more than 3-4 months. I finally broke down and bought this bottle after seeing it on the shelves for months. Checking here first for any really bad reviews also convinced me to give it one more try. What a pleasant surprise this one is! The aroma is of vanilla, tropical fruits, and a faint whiff of nutmeg. The taste is even more pronounced than the aroma without being overwhelming, and it almost can be sipped neat with a natural sweetness. There are no oak flavors from barrels. I chose to add a few cubes of ice made from Icelandic Glacier Water because glacier ice seems to mellow out any bad flavors in rums. At only $17 per bottle, I will continue to buy this one. Why have I waited so long to go back to this old friend! Something about the bottle, and then opening it up and tasting it, I thought I didn’t like it, wouldn’t like it, but as I’ve mixed with it, a complexity and playfulness I wasn’t expecting started to show through. I enjoy neat or mixed. Wow, to start off with. I'm not 60. I don't regularly buy $100+ bottles of liquor. I don't have tons of experience, but I have a fair amount. I hop around brands constantly and I think I've only repeat purchased one brand at this point, I've bought 2 bottles of Captain Morgan in my life, when I was younger. Everything else has been a new purchase for me because I love exploring brands. Well, this review is about the rum, not myself, I just wanted to get that out of the way. This rum is the only liquor I've ever been able to tolerate neat. I don't drink it that way regularly but I try it with each bottle of liquor once or twice to get an idea of how horribly offending it is to the mouth. So far there was nothing I drank straight that made me think "I could see myself consuming this neat regularly", incredibly it came in the form of a $15 bottle of rum. 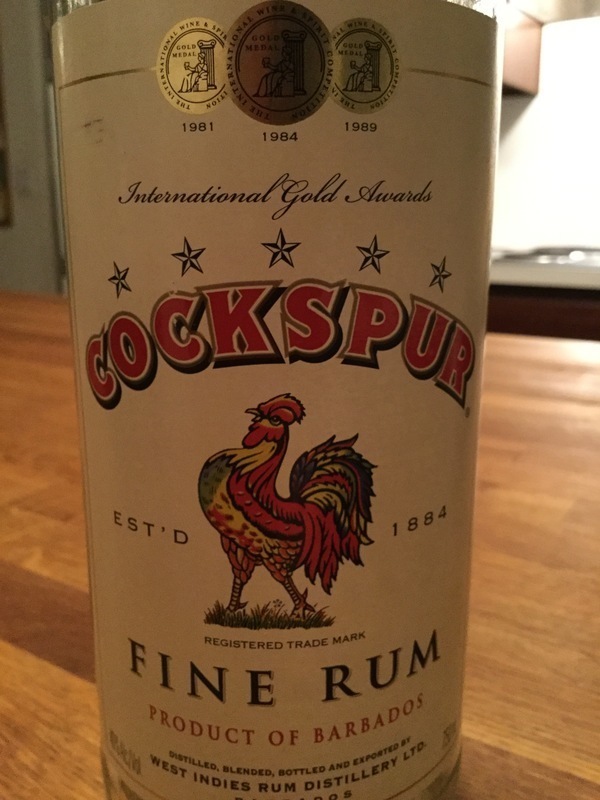 It might help that I always imagine my vacations when I was much younger in the caribbean when I drink rum, but Cockspur Fine is extremely drinkable regardless. That said, it doesn't get a 10/10 because it's not huge on flavor. It's a little sweet and of course just plain "tastes like rum", if that makes sense. But it has no big, bold, special flavors like other rums I've tried, which is perfectly fine in my opinion. The harsh alcohol burn is almost non existent in this one, and that's high praise from me considering even higher ABV beer starts to burn my tongue significantly and unpleasantly. Sugar: 0-4 GPL. Right off the start there is Oak, Vanilla, a bit of caramel and some biting spice. This is a golden rum which comes from limited aging. Like other “Mixing “ rums this one has some harsh alcohol taste and aroma that cola or other juice mixes will hide and make for a good mixed drink. Nice flavour, mixes well, better than most on a similar budget. Won't offend most if received as a gift. Very drinkable. Light amber color, some heat, not overly complex and the flavors don't pop out at you. A fair price for a mixer from Barbados. Better than most rums comparable in price. I like that Cockspur uses both the traditional column and pot stills to distill their rums. Very basic rum. Use it for mixing, since there is nothing to really savor here. There's nothing very special with this one, but it's a good mix and standard bar-rail in Barbados. If you're there, I'd get the far-superior Mount Gay XO instead for not a lot of extra money or the Eclipse for a straight-swap if available. Inoffensive rum that mixes well and can be drunk neat. Fairly bland flavour and a harsh afterburn but nothing really bad to note.